What do you want when you buy Professional Liability insurance? Coverage designed exclusively for PADI members. 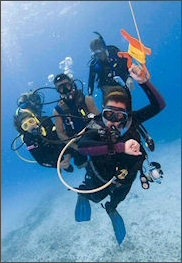 An experienced insurance team known in the dive industry. Knowledgeable and friendly customer service representatives. Why PADI-endorsed Professional Liability Insurance? Emergencies are personal – your insurance team should be personal too. Not all insurance polices offer the same coverage or service. Take comfort knowing that you have coverage backed by a team of experienced professionals you know and trust. For the past 34 years, the team of PADI and Vicencia & Buckley have worked together to support PADI Members through the most challenging times. In these economic times you deserve more value and security - your business assets and the money you must spend to protect them are more important than ever. Don’t assume- compare today and see the value for yourself.